Picking One Word for the Year to give you focus and strength can be empowering as it allows you to carefully craft your goals around what matters to you most. If you need help choosing your word, you will want to check out my NEW Word of the Year Worksheet! I am Going to Rise! My Goals, My Focus, and My Word of the Year! Today is my birthday. It’s my first birthday without my mom. A year ago today, I turned 30 inside a small ER hospital room with my mom and dad. It was the beginning of the end. What followed has been the hardest year of my life; a daily struggle to define a new life without her support, her company, her love. For a year, I have struggled to pick up the pieces. As a daughter, sister, friend, wife, and new mom, I felt like a shadow of my old self, constantly updating the mask I wore. Fake it to you make it, right? It’s not that I didn’t feel happy. I have been happy; the joy that Liam brings me alone is intense overwhelming. It’s just that I haven’t quite known who I am anymore. I haven’t known how to move forward, where I want to go next, who I want to be in this very different landscape that is my life. So much has changed in the last 12 months so, of course, I have changed as well. It feels a little dramatic, but it’s my reality. So I have chosen a word for the year, something I have done in the past. It offers a focal point for creating goals for the year and a word to draw motivation from when things feel hard. My word is RISE. 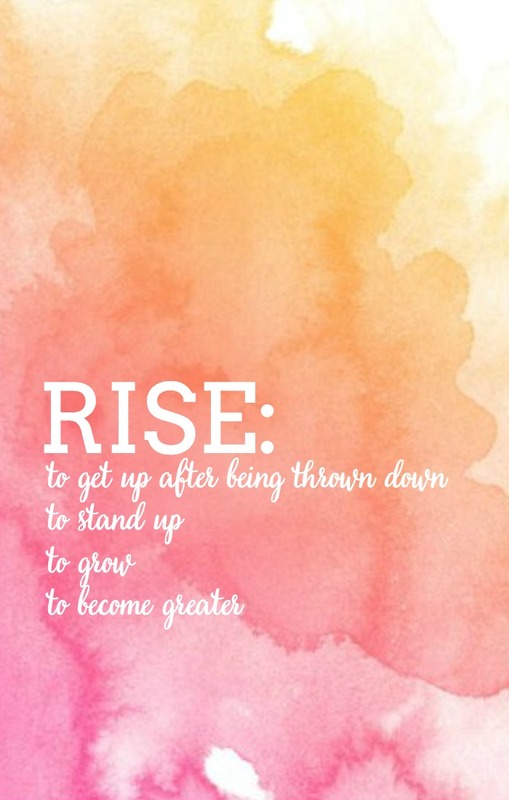 Rise means to get up after being thrown down, to stand up, to grow, to become stronger. What feels right about this choice is that it’s a verb. It requires me to do the rising. No one can do the work for me. No one should have the responsibility or pressure to make me feel better. It has to be me. My actions. My choices. My feelings. I don’t know everything that this will entail this year, but here is what I know so far and one is pretty exciting! I am going to rise and find a community of support. This means being a good friend to the ones already in my life – checking in more often, making (not finding) time for them in my schedule, supporting them, and offering them my unwavering support. It means connecting to my fellow bloggers who I’ve lost touch with and the ones I have’t met yet. It means attending conferences or retreat weekends. Next weekend is my first blogger event in a long time which I am super excited about! 7 other bloggers will be joining me in Chicago for a weekend of brainstorming, sharing ideas, and working together as a community. This also means finding new community. Working from home has often left me feeling a bit lonely, a feeling that has only been enhanced since losing Mom. I’m going to sign Liam and myself up for some baby activity classes this summer to get out of the house and interact with other moms. I am going to rise and build my business, my creativity, my passions. When I went part time after Mom was diagnosed with cancer and then when I took a complete break after her passing, my business took a hit. My stats went down which definitely matter to us bloggers and to companies we work for, but that wasn’t the most important thing to me. My creativity, passion and drive for what I do went down, and I’ve missed it terribly. So it’s time to give myself some room to do things a little differently, to stop running in the hamster wheel and give myself some breathing room to create things I love and am proud of, and to invest in my self. This all leads to the big decision I made a couple weeks ago, one I am nervous about and also thrilled about. To me, feeling this way is a very good sign because it means I am on the edge of something that will push me which inevitably will help me grow and rise. Photography is something I have always loved. I have invested in professional photographers for my family, I have invested in cameras, I have invested time into learning and making my blogging photography better. Seeing pictures from the very beginning to now is night and day. Now I have decided to invest in a photography workshop for lifestyle photographers. At this workshop, I will learn photography basics for shooting people that move instead of food – important essentials like focus, posing, light, and handy tools of the trade. I will also meet with a business coach to discuss where I am now and how I can grow, especially in the photography area of my business. The Love Nerds isn’t going anywhere. I love this blog and I love all of you. Taking this workshop and investing in me is a way to enhance what I am already producing for my blog, making my pictures even better in addition to helping me open doors to a new avenue of business and income for my family. My dream? Capturing family moments, especially the small ones, so that families can treasure them for years to come. After losing Mom, pictures became even more important. Tiny moments captured of an immense love that I can share with Liam and any other children I have. And even more so, capturing moments of children being children. I have this idea of Imagination Sessions, taking photos of children being children. Maybe that means putting on a pair of fairy wings and letting a little girl run around or maybe that means setting up an elaborate stage for Captain America or Harry Potter. These ideas and feelings have helped me feel excited again, even if I’m also terrified of failure. Investing in myself through this workshop is only one way I need to invest in myself this year. Somewhere in the last year, my self-esteem has disappeared. I know one small piece of this comes from my mom being my pillar of support, but I know that’s not the whole story. Upheaval can create cracks for pesky insecurities to take root. Becoming a new mom alone can create enough insecurity – am I doing this right? am I making the right choices? I know I don’t want to continue to feel this way but only I can make the change necessary. Only I can tell myself to get up off the ground, to start prioritizing the way I want to feel versus being crushed by stress and the weight of loss, and to rise. Want help choosing your word of the year?! Head over now to grab my FREE Word of the Year Worksheet! The Desire Map: A Guide to Creating Goals with Soul <— One of my favorites that helped me really think about goal setting from a different perspective as it challenges you to think about how you want to feel and crafting your goals around getting there. 9 Things Successful People Do Differently <— A shorter read at around 100 pages with short, digestible tips. StrengthsFinder 2.0 <— My husband has actually gone through Strengths coach training, so it’s something we’ve talked a LOT about. It has actually helped us understand our relationship a little bit better in addition to our own individual pursuits. Happy birthday! “Rise” is a great declaration for this year. I am so glad to hear you and the little guy are going to start going to some baby classes. I know that they have been invaluable to me – I’ve made some new local friends and they give us a safe, easy way to get out of the house. Enjoy! First of all, Happy Birthday! I know it’s been such a hard year for you but I am so thrilled at the strides you’re making towards your future both business-wise and personally! I can’t wait to see you next week! Love you, girl!